Next: Nerf Rival Blaster Prometheus MXVIII-20K - Fires 8 Rounds Per Second! 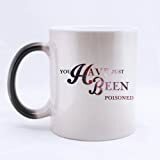 The next time someone asks you to get them a cup of coffee or tea, be sure to deliver it to them in one of these cool new You've Been Poisoned Coffee Mugs. When filled with a hot beverage, the drinker of this normal looking ceramic mug will be none the wiser that they'll soon be delivered a sinister message printed on the bottom, "You've Been Poisoned." Perfect for pranks in any stuffy office break room or even for your loved ones at home.